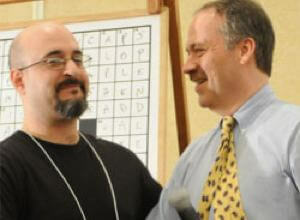 Contestants bear down on their crosswords at the 2012 American Crossword Puzzle Tournament. Meanwhile, computer program Dr. Fill was outperforming large numbers of its human competitors. Inspired by Watson’s success on Jeopardy!, AI specialist Matthew Ginsberg wanted to see if computers could out-duel humans in another language-based game. What he created was Dr. Fill, a software program that fills in the vertical and horizontal boxes of a crossword puzzle. A few weeks ago Ginsberg pitted Dr. Fill against a field of human competitors at the American Crossword Puzzle Tournament in Brooklyn. The entry was unofficial, however, as the rules require that the $5,000 prize money must go to a human being. Singularity Hub got in touch with Dr. Ginsberg and asked him about how Dr. Fill works, and about its surprising performance in the tournament. Just as Watson was blazing fast at Jeopardy!’s buzzer, Dr. Fill makes short work of its crosswords – at least the relatively easy ones. It finishes crosswords of average difficulty in about 30 seconds, then, like a gloating perfectionist, it spends another minute and a half to see if any of its answers can be improved upon. How’s that compare to human solve times? Even the fastest puzzle masters can’t complete a tournament-level puzzle in under two minutes. Tougher puzzles make Dr. Fill ponder for three minutes, about half as long as humans need. Speed helps, as tournament points are won with speed, but the answers have to be right, of course. Ginsberg had reason to feel confident about Dr. Fill’s chances going into the tournament. Prior to the actual contest the program ran simulations of the prior 15 tournaments. It topped the competition three times. Tournament organizers were handing out “I BEAT DR. FILL” buttons to anyone who out-solved the software. How well did Dr. Fill do this time? It placed 141st out of nearly 600 contestants. Hope they made enough buttons. How could Dr. Fill be bettered by 140 sluggish-brained humans? I suggested to Ginsberg that the tournament organizers may have stacked the deck against Dr. Fill this year by choosing crosswords that were particularly unorthodox. “They did,” he responded, “but not on purpose. This year there were two such puzzles (which has never happened before).” Had the two puzzles not reared their illogical heads, Ginsberg told me, Dr. Fill would have placed 19th. Ginsberg is into other mind-bending pursuits aside from crosswords. He earned a PhD in mathematics at Oxford at the age of 24, then went on to teach artificial intelligence at Stanford for nine years. He has written a book entitled “Essentials of Artificial Intelligence” and is the editor of “Readings in Nonmonotonic Reasoning.” If that sounds like light stuff to you (because you’re a genius! ), he co-founded the University of Oregon’s Computational Research Laboratory (CIRL). His current day job is chief executive of On Time Systems, a software company that helps clients like the US Air Force calculate efficient flight paths for their aircraft.